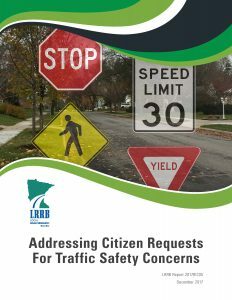 A new LRRB guidebook provides local agency staff with a best practice approach to addressing common citizen requests for traffic safety concerns (i.e. signing and pavement markings, not larger scale infrastructure or planning projects). This guidebook focuses on the importance of communication with citizens when responding to traffic safety concerns or requests. It also provides guidance on logging requests, steps for following up on a request, standard responses, and an explanation of why a requested strategy may or may not be the appropriate solution.